1) I know I said that I wouldn’t really mention beauty subscription boxes again – until something new happened, at least – but I was delighted to see that JolieBox had managed to get some Institut Esthederm samples included. 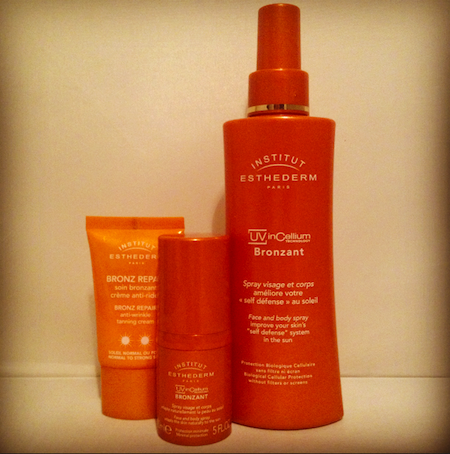 I really do think think that Institut Esthederm make some of the best suncare going – you can read my guide to their products here. Samples are a brilliant way to be introduced to a brand and these are probably the best samples I have seen in any of the boxes so far – and I’m pleased because I can stick them in my handbag! 4) I made a cheeky little guest appearance in Pixiwoo‘s video this week – we were in the Chanel Pop-Up for an exclusive first look. Before the press, even! The girls did an amazing 70’s eye look with Illusion d’Ombre (and you know how I love a bit of Mirifique) and a beautiful red gloss. You can see that video below! 5) As you read this, I am en route to Greece for a week’s hols. Please don’t be sad/angry/offended if your comment lies unpublished for a while, I am intending to actually take some time off for once! So no laptop. Though we’ll see how long that lasts.. I have 10,000 words to write for an MA submission, so I must try and focus. SOME HOLIDAY! Next Post Champneys Tring in the Sunshine!